Add realism to the behavior of animals in Minecraft. 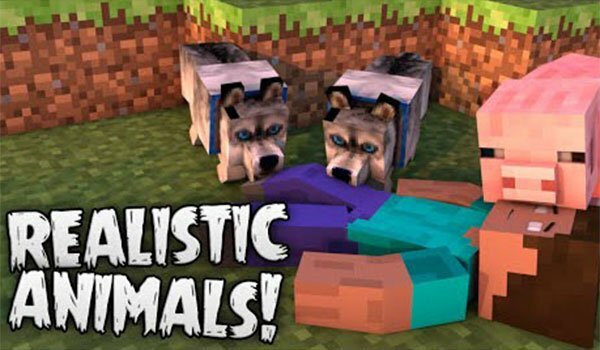 Hungry Animals 1.7.10 is a mod that is responsible for changing the behavior of animals, adding new parameters and options to AI (Artificial Intelligence) animals like chickens, cows or pigs. Now all game animals need to eat to survive, but we do not worry about it, since they themselves searching tall grass to feed. When eating, as happens in reality, animals excrete. These droppings can store and subsequently used as fertilizer for our crops. If we let the droppings accumulate in the pens, the animals sick. So we must also ensure the health and hygiene of our animals. This modification in the IA, is also responsible for giving more autonomy to the animals. They themselves autonomously seek partner with which to reproduce and bring new animals to the world. How to install Hungry Animals Mod for Minecraft 1.7.10?